This is a journey to a village somewhere in the great north of Alaska. The students will get a chance to learn how the native Eskimo's deal with the problems that life can hand out. 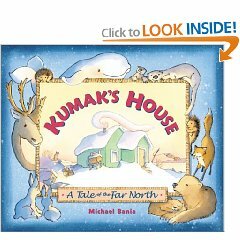 The story, "Kumak's House", deals with a man who is unhappy with the size of his house. He visits an elder to get advice on what to do. She gives him advice over and over, but ..... well you will see. You are a famous anthropologist and you have just heard story from somewhere in Alaska. You need to find out why the story was told and what the meaning is. The story also has a lot of differen native eskimo activiyties and you must find out what they used to complete these activities. Good luck and enjoy your trip to the far north, remember dress warm it is a long cold journey.